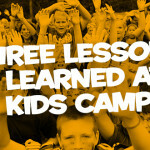 CentriKid Camps provides a week-long camp experience for 3rd-6th graders every summer. Here are 14 fun facts you may not have known about CentriKid. 1. CentriKid traces its history back through 2 different camp programs – Centrifuge the original LifeWay camp for students and Crosspoint the sports camp for kids and preteens that preceded CentriKid. 2. We once had a mascot that was a remote-controlled mini-cooper car. 3. Campers have given over a million dollars to mission projects at IMB and NAMB through CentriKid. 4. There’s a 4 year plan for the spiritual direction at camp. This way, we cover different aspects of God and our relationship with him year to year. 5. We’ve had 2 different logos in our history….the current one, and the one with the dash. 6. There have been 2 official OMC t-shirt backs…but dozens of proposed changes and designs left on the drawing board. 7. Originally, OMC shirts were only for staffers, and they were just random colors not associated with their Bible study groups. 8. The first year OMC shirts were sold in the camp store was 2008, the only color for sale was green. 9. Pink, purple, and camo were rejected colors of OMC shirts for the camp store in 2009. We went with red. 10. Cooper the Kangaroo had a fun back-story, even though he’s never made an appearance in camp programming. 11. With the new (current) logo, we dropped the dash from the official spelling of CentriKid. 12. CentriKid has never officially capitalized the “KID,” but early on a lot of people wrote it that way because of the LifeWay product TeamKID. 13. OMC was not a part of the very first years of CentriKid. 14. OMC evolved from a game called “Grab Bag Adventure” that involved cutting strips of paper with individual tasks typed on them and putting them in brown paper sacks. We are excited about what the future holds for CentriKid. For 2015, FIT – Faith in Training, campers will learn about the spiritual practices that help them grow in their faith. Check out more info about the 2015 camp theme at the CentriKid blog. JE (@coachechols) leads the @centrikid camps and events team for LifeWay Kids. He met his wife Emily working summer camp, they serve in the kids area on Sundays at church, and they are blessed with their daughter #BabyMadison who was born in 2011.